The above info came from Kirbyfan106, and was edited by yours truly (contact me). The image came from pia.co.jp. 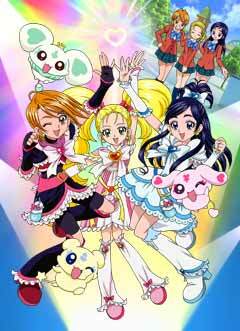 Pretty Cure is a Magical girl anime split into 3 series; Pretty Cure, Pretty Cure Max Heart, and Pretty Cure Splash Star. While the first one revolves around Nagisa Misumi and Honoka Yukishiro and so does the second, which also revolves around Hikari Kujo, a.k.a. the Queen, the third revolves around Saki Hyuuga and Mai Mishou. In each series, the girls who star in the anime are polar opposites until they cross paths with each other. When they meet cute little creatures from the Garden of Light/Land of Fountains, they discover that they can transform to battle evil super-villains from the Dusk Zone/Dark Fall, ruled by the Dark King/Akudaikaan and stop them from acquiring the Prism Stones/the seven fountains that feed the World Tree. Together, these girls are Pretty Cure. The above description came from Kirbyfan106, and was edited by yours truly (contact me).